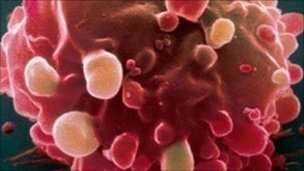 British researchers believe they have explained why some families are incredibly vulnerable to bowel cancer. They have found two genes, which are passed from parent to child, that greatly increase the risk of a tumor forming. The study, published in Nature Genetics, analyzed DNA from 20 people with a strong family history. The findings could be used to develop a test to judge someone’s risk of the disease. One of the people who took part in the study, Joe Wiegand from Hampshire, was diagnosed with bowel cancer when he was 28. Most of his colon had to be removed. “There’s a very strong history of bowel cancer in my family – my dad’s mother and sister both had it, my dad was diagnosed with it at 43 and a few cousins have had bowel cancers and brain tumors. The researchers looked at the genetic code of 20 people and found faults in two genes could increase the chance of developing the cancer. Lead researcher, Prof. Ian Tomlinson from the University of Oxford, said: “There are some families where large numbers of relatives develop bowel cancer, but who don’t have any of the known gene faults that raise the risk of developing the disease. He said that, in the short-term, the findings could be used to work out which people had a high risk of developing bowel cancer and, in families with a high incidence of the cancer, to work out which people were at risk and needed more regular screening. He said it was “conceivable” that specific therapies could be designed to overcome these mutations in the future.